Baltimore rowhouses are found in neighborhoods across the city from richly ornamented three-story mansions in Bolton Hill to narrow alley houses in Fell’s Point. This guide is a resource for anyone interested in learning more about the architecture, materials and design of the Baltimore rowhouse. This resource includes excerpts from the excellent New York City Landmarks Preservation Commission Rowhouse Manual along with contributions from Mary Ellen Hayward, co-author of The Baltimore Rowhouse. 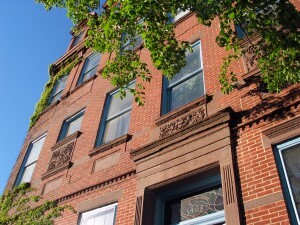 Find more helpful information for historic rowhouse residents with our resources for homeowners. Lintel – The horizontal beam that spans the top of the opening for the door that supports the rest of the building above the door. Transom – A horizontally-oriented window, typically rectangular, located above the door. Threshold – The horizontal base of the door that is raised above the exterior, signaling a transition from outside to inside. Door – A slab-like element that closes a wall opening. Doors can opening by swinging or sliding. 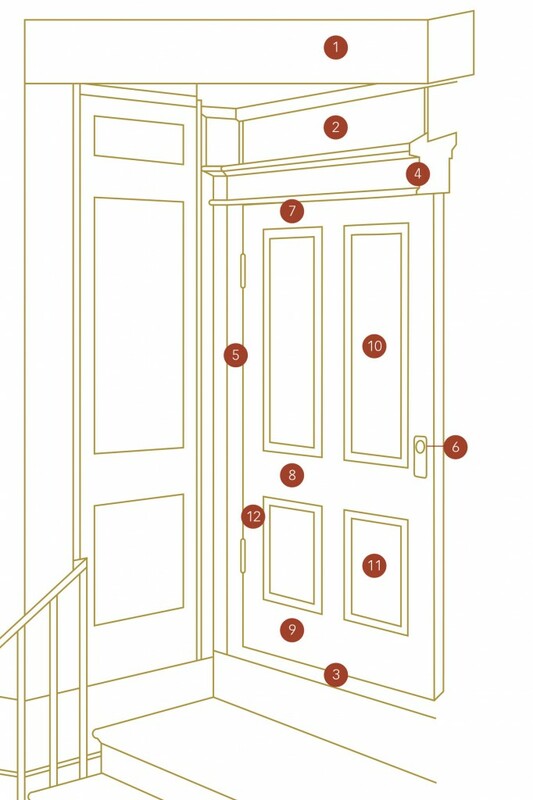 Door frame – The opening and surrounding trim of the passage between rooms or the entrance of the building. Doorjam – Facing sides of the wall opening for the passage in which a door is set. Doorknob – The rotating handle of the locking mechanism. Also doubles the function of a door pull. Rail – The horizontal framing member of a door. Top Rail – The upper-most horizontal framing member of a door. Lock Rail – The horizontal framing member of a door located in the lower-middle of the door in which the door pull or locking mechanism is set. Bottom Rail – The bottom-most horizontal framing member of a door. Panel – A small, plane surface, typically rectangular, that fills the space between the rails and stiles. Can be either opaque or glazed. Middle Panel – The panels located between the frieze panels and the bottom panels. Bottom Panel – The bottom-most panels in a door. Stile – The vertical framing member of a door. 12. Hanging Stile – The vertical framing member of a door to which the hinges attach. 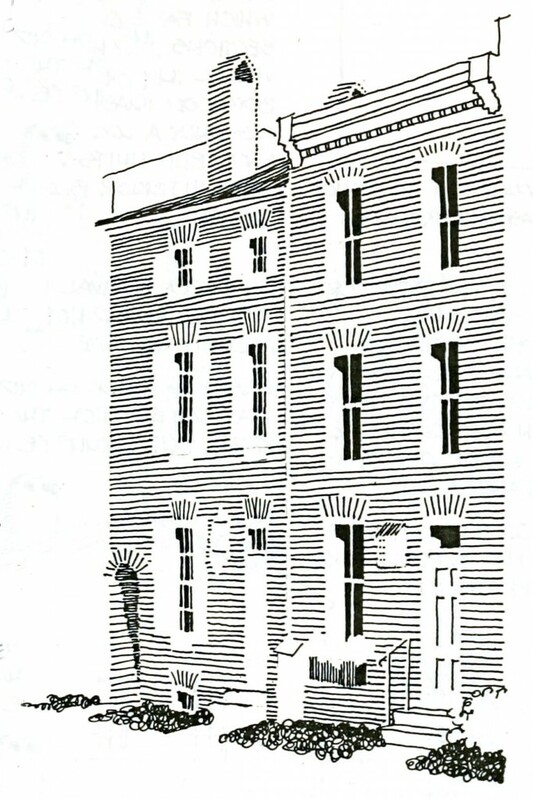 Image and text courtesy the NYC Rowhouse Manual. Brick Mold – The molding, usually wooden, that covers the gap between the window frame and the opening into which the window is set. Casing – The molding surrounding the window jamb, usually seen on the exterior on frame buildings. Lights/Glazing/Panes – The glass or pieces of glass that makes up the transparent portion of a window. Muntin – The narrow horizontal and vertical pieces that hold together the panes of glass in multi-pane windows. 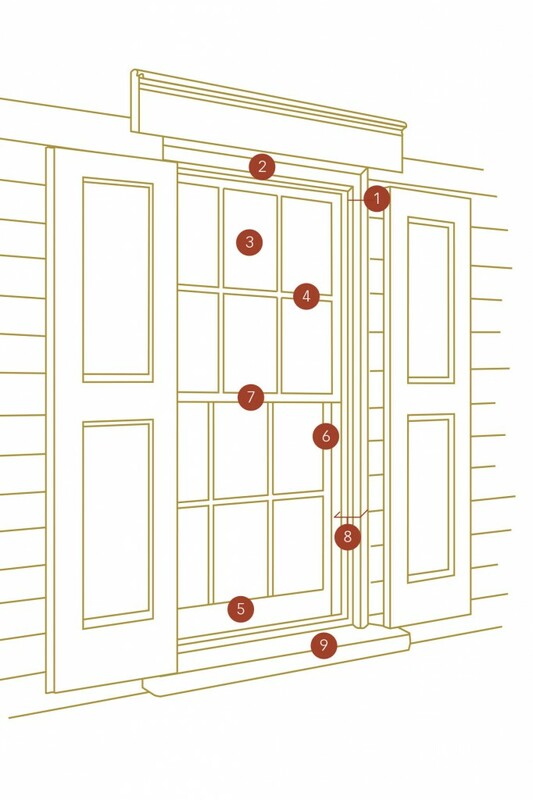 Sash – The wooden frame located inside the jamb that holds the glass; also know as the operable component of the window. Stiles – The vertical members of the sash. Meeting Rails – The bottom horizontal member of the upper sash and the top member of the lower sash. Jamb – The sides and top of a window. Still – The bottom side of the window usually made out of heavier material that slopes away from the building to help shed water. Background on bricks courtesy Mary Ellen Hayward. Up to the 1850s, rowhouses in Baltimore used poor quality salmon bricks produced at brickyards in south and southwest Baltimore. Because this brick was so porous, most property-owners painted brick houses regularly leading visitors in the 1830s and 1840s to remarked on varied paint colors found on rowhouses. During same period, high-style, Greek-Revival large houses and public buildings were painted cream or dove grey for a “neoclassical” look. In 1850s, local builders began to use pressed brick for better houses. Initially manufactured by hand with a brick press, they were later made by machine. This harder brick did not need to be painted and the regular size allowed builders to lay the bricks with much smaller mortar joints. It was fashionable to “stripe” the mortar joints with white paint to make them more prominent. Pressed bricks were only used on the facade, side and rear walls were still built with locally made brick. By the 1850s, major brickyards were also located in East Baltimore in the area north of Johns Hopkins Hospital. Around 1890, a new kind of brick became available and was first used in high-style houses like the Goucher House at 2313 St. Paul Street near Lovely Lane Methodist Church. Often called Roman brick, the bricks were narrow and very hard and yellow-brown in color and were commonly used in Renaissance Revival style buildings and rowhouses of the period. By the early 1900s when major building developers were erecting multiple rows of two-story houses across the city, they bragged in their ads that these houses “never needed painting,” These bricks also called iron-spot bricks or vitrified bricks. By the late 1930s builders using red bricks again for Colonial Revival style buildings, houses, and rowhouses. Background on marble courtesy Adam Fracchia. 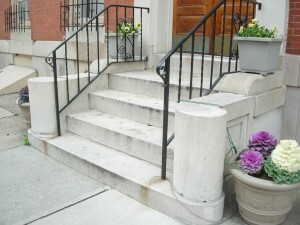 In the 19th century, most marble for steps and buildings was quarried in Baltimore County at sites near Texas and Cockeysville. Beaver Dam is estimated to have supplied 60% of the city’s marble steps but local builders also purchased stone from Georgia, Alabama, Vermont, and Pennsylvania. As Baltimore’s demand for marble peaked in the early 20th century, quarries in Georgia and other southern states used modern equipment and cheap labor to invade the market and undersell local quarries. The importance of marble diminished after the 1920s concrete and stone often substituting for marble on newer daylight rowhouses. Some home-owners even painted their steps leading H. L. Mencken to remark, “Some people in recent times have gone so far as to paint their marble trim, an obscenity perhaps unmatched in Christendom.” The last stone came out of the Beaver Dam Quarry in 1934 to be used for the Arts and Sciences Building at the University of Maryland, College Park.